Mormon Handcart Historic Site in Wyoming, part of the Mormon Pioneer Trail. 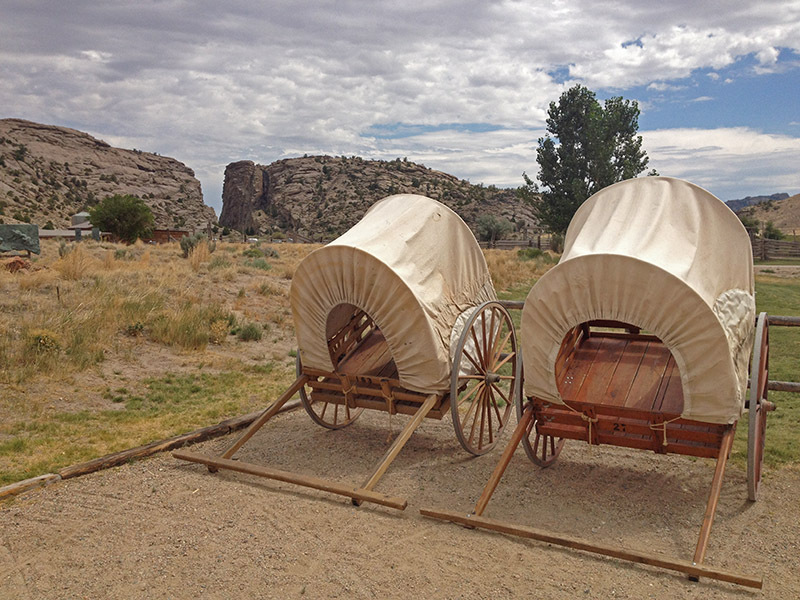 The Mormon Pioneer National Historic Trail is a 1,300 mile route that follows the tracks of Brigham Young and thousands of members of The Church of Jesus Christ of Latter-day Saints on their westward migration. The official route begins in Nauvoo, Illinois (an early Mormon settlement) and extends to Salt Lake City, Utah. Large segments follow or parallel the Oregon and California Trails on the way. After conflicts with their neighbors in Nauvoo, Mormon leader Brigham Young decided the community needed to find a safe, permanent home somewhere new — the Great Basin. They were being pushed out of Nauvoo in the middle of winter in 1846 and hundreds of people were forced to cross the icy Mississippi River by wagon. From there they faced more challenges: heavy rains had turned portions of the Iowa plains into knee-deep mud, causing grave delays. A large group settled temporarily in Winter Quarters, Nebraska and spent the next winter there. Early in the spring they moved on across Nebraska and Wyoming — those who survived the trip started new lives at the church’s headquarters in Salt Lake City, Utah.